Powerful 5 Coils - Breaking through the technical difficulties of the industry, take the lead in upgrading to 5 coils. Wireless charging pad built-in 5 coils provide a wider charging area to boost charging efficiency. 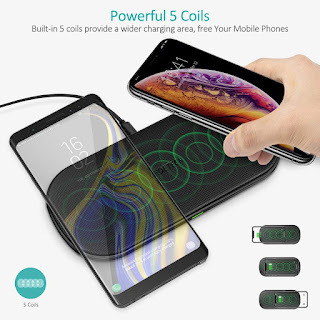 Dual Qi Fast Charging Pad - This wireless charger features two Qi-compatible charging mats, having the ability of charging two phones simultaneously at up to 18W output. Supports fast charging speed for both New iPhones and Samsung New models, thus enabling today's fastest way to wirelessly charge your phone. Two Charging Ways - More wider charging area for single phone, no need to fumble with your smartphone for a better charging position, achieve true wireless charging. With our equipped 18W QC 3.0 adpater, easy to fast charging two phones at the same time. (Like iPhone X XS XS Max XR iPhone 8 8Plus or Samsung Galaxy S10, S10+, S10E, Note 9 S9 S9+ Note 8 S8). Note: This charger incompatible with iPad, Air Pods, Smart Watches(iWatch, Samsung Galaxy Gear 3/4...). Premium & Stylish Design - Designed with anti-slip PU leather surface, not only provides sleek and modern style, but also prevents your smartphone from sliding. The anti-slip pads on the bottom helps keep your pad in place. To achieve good heat dissipation effect and avoid intermittent charge, we also designed heat dissipation holes at the bottom to keep your phone cool while charging. What You Get - 1 Dual Fast Wireless Charging Pad, 1 Qualcomm 18W Quick Charge Adapter, 1 USB-C Charging Cable, 1 User Manual, 18 Months Warranty and Life Time technical support.